This 12-year-old schoolboy has carried his best mate to school everyday, come rain or shine. Zhang Ze, who was diagnosed with a rare muscle condition sometimes known as the rag doll disease at the age of four, has been able to go to school every day for the past six years thanks to his good friend, Xu Bingyang, 12. So, his friend stepped up and makes sure Zhang gets to and from school every day, and helps him get from class to class at the Hebazi Town Central Primary School in the county of Qingshen. 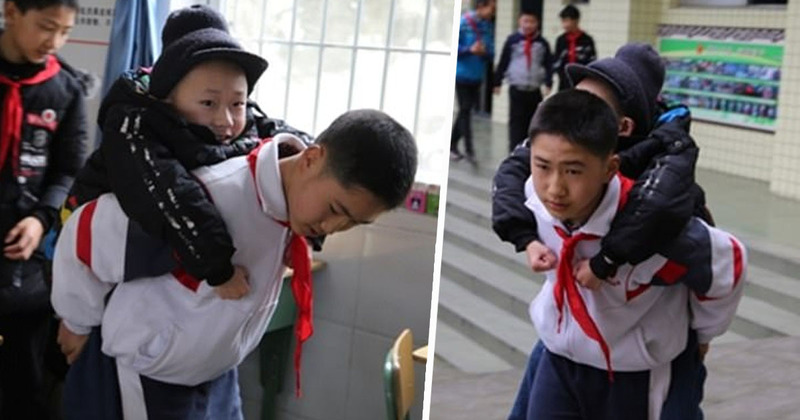 The sixth-graders go to school together every day, with Xu carrying Zhang around on his back, piggybacking him from place to place so his day is a little easier since they met in the first grade. Xu also helps Zhang with other little tasks most of us take for granted, like refilling his water bottle, handing in his homework and going to the bathroom. Xu Bingyang is my best friend. Every day, he studies with me, chats with me and plays with me. [I] thank him to look after me like this every day. Apparently it’s really in-character for Xu, who is hardworking, down-to-earth and very mature, according to one of the pair’s teachers. For so many years, [Xu] has continued doing good deeds and never complained in front of the teachers and classmates. Amazingly, Xu hadn’t even told his mum about what he does to help his mate at school, and just got on with his truly selfless act of friendship. Xu, who is much taller and stronger than Zhang, told reporters that it was his pleasure to be his friend’s ‘walking stick’. I weigh more than 40kg (88 pounds) and Zhang Ze only weighs about 25kg (55 pounds), so it’s okay for me to carry him. I am bigger than him. I thought if I didn’t help him, nobody else would. Talk about giving going to school every weekday morning some real purpose – beyond getting a good education and all that. Six years as a day, Qingyuan primary school student Xu Binyang used love to hold up a clear sky for his classmates.